Copied from an original in possession of Lela Barber Baker c. 1977. On back: "Great Grandma, Great Grandpa Edgecomb". The original photo was glued to the back of glass which had broken. Fortunately the cracks in the glass did not extend over the faces. This image was scanned from a negative in possession of Steve Baskauf and retouched thanks to Alan White. 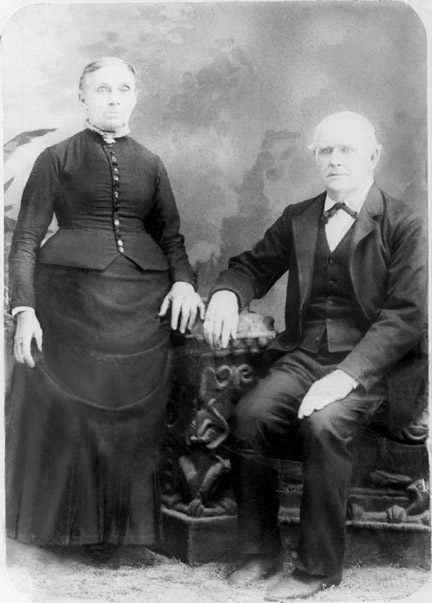 On 13 Nov 1840, Walter married Laura Bassitt2, daughter of Samuel and Elsie (Lewis) Bassitt. "After his marriage, our subject engaged in farming on a rented farm. He has owned two farms besides the one he now occupies"1 (in 1885). One of these farms was 60 acres in the southwest quarter of section 24 in Monroe Township (then in Putnam Co.) which he bought on 17 Jul 18383. This land was about two miles north of land purchased by his brothers Lansil and Ezra a few years earlier. 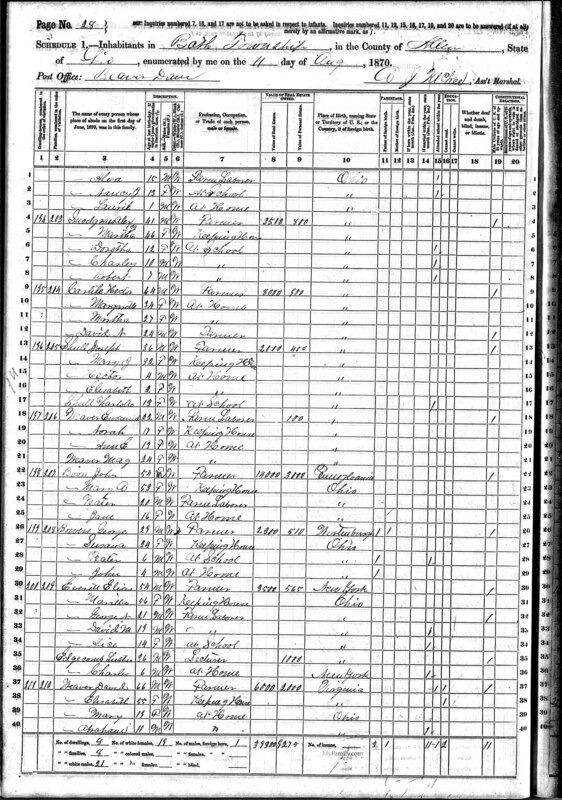 However, it does not appear that Walter and Laura lived there, since they were listed as "of Allen Co." when they sold it in 18424. 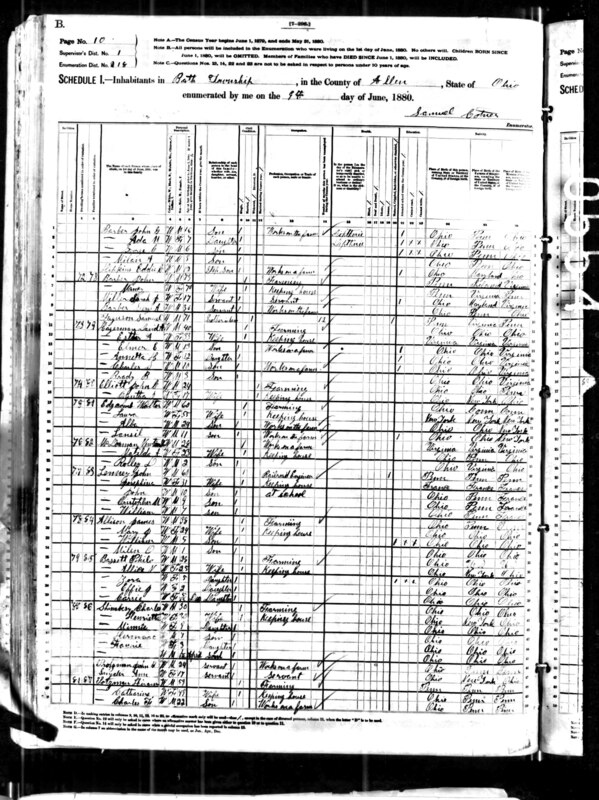 It is likely that they were living near where his father moved in section 11 in 1845. 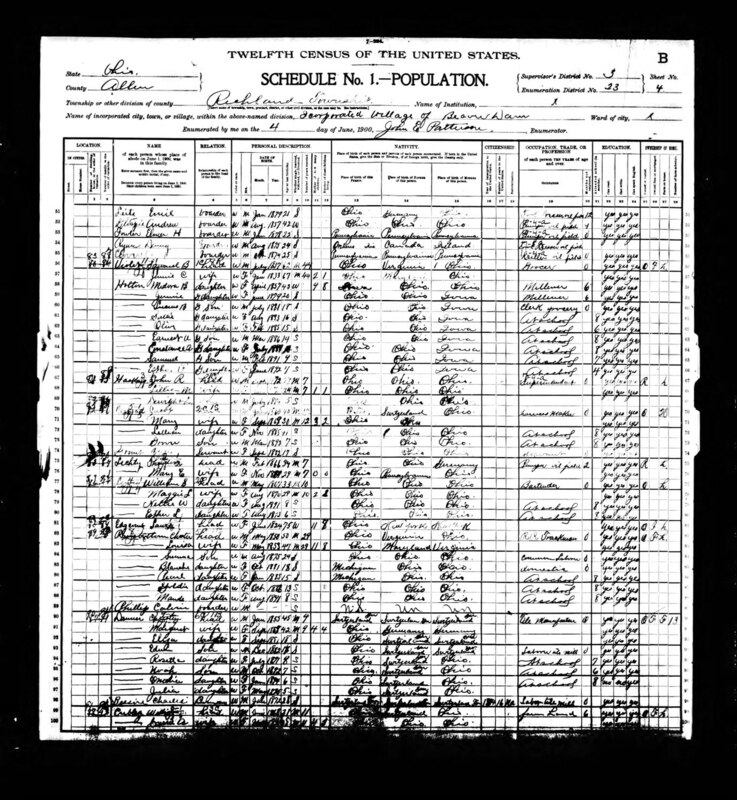 The 1850 census lists Walter's household after his father Uriah and his sister Clarinda Snyder and before Elias Everett who lived at the corner of Bluelick Rd. and the Dixie Hwy. This would also locate their family less than a mile from Laura's parents' farm. Walter also bought a 40 acre farm in section 12 in 1849, but this is probably not where he lived. Now Grand Pap and Grandmother, I will talk to you with the pen a little while as we cannot talk face to face, and will tell you that I am all over well and like to soldier Bully well and I hope these few lines may find you two well although your heads is ablossoming with Grey hairs. I trust that I and You will live to see Each other on Earth and talk face to face and then I can have the Pleasure of atelling you some good storys. I tell You there is plenty of cesesh [secessionist] families around here but thank the Lord they have not much to be saucy over. They have nothing in the shape of Chickens, pigs, geese, or anything that can be eat and the soldiers can eat anything now. There is not but two men sick in the Regt. There has not a man died since I came out in the Regiment. When we was at Clifton there was Eight privates and one Lieutenant and I was among the squad went out on a Scout and we only saw two Rebbels and we captured both of them and the next morning he under took to get away and as he was apassing the Picket line they saw him and Halted him three times and he no halt and the picket shot him dead and we fetched the other one down here with us and last night he undertook to get out of the guard house and he was in the upper story and he jumped out of the window and broke one leg and one of his arms and I tell You he did not get far. I expect he will be shot as a spy for his papers show that he is a Rebbel spy of the worst kind. Old forest has got out of this neck of woods I guess and it is well for his old Jacket that he did for if we had of a got ahold of him we would of apunched his hide so full of holes that it would not hold Water, for we have about 8 or 9 thousand men here and plenty of Artillery. I tell you there is plenty of News to read here now and we have nothing to do but to read it. I suppose you have heard about the fight at Richmond. General Breckenritz and Beaureguard say that they can do nothing and they might just as well give up the job and so think I. I think that we will get to come home to stay against one year from this time. There is a Jolly old set of boys here now I tell you. There is all kinds of tearing around all the time. We are Camped in a pretty place. It is a nice Country through here as I ever saw. There is plenty of fine trees to shade us. But Alfred's wish to tell his grandparents some good stories face to face was not to be granted. Two months later he was killed in Atlanta, Georgia. 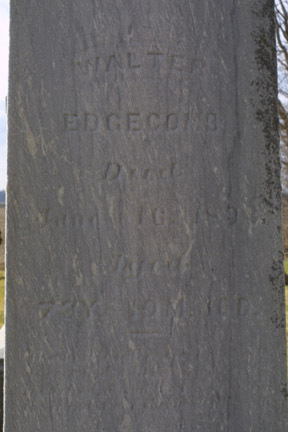 Lewis Alfred Edgecomb, 21 Feb 1847 - 21 Jul 1864. Sarah Ellen (Phillips), b. 24 Mar 1851, m. Allen Phillips. Mary Jane (White), b. 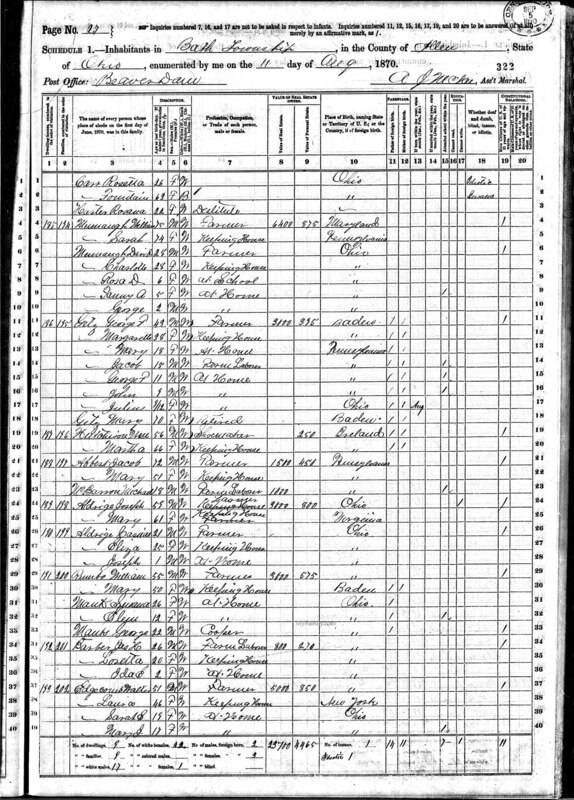 20 Sep 1852, m. Willis W. White. Elsie M. (Philips), b. 30 Mar 1857, m. W. Shannon Phillips. 1. History of Allen County, Ohio. Chicago: Warner, Beers & Co., 1885, p. 579. 3. Deeds, Book I, p. 386, Allen Co. OH Recorder's Office. 4. Deeds, Book I, p. 387, 7 Jun 1842, Allen Co. OH Recorder's Office. 5. R.H. Harrison, Atlas of Allen County, Ohio. Philadelphia: R.H. Harrison, 1880, p. 27. 6. View original scan 1 Scan 2 Original on file at the Allen County Museum. 7. Interview of Lela Barber Baker by Steve Bassett (Baskauf) 13 Aug. 1978 in which she recalled things told to her by her grandmother Loretta Edgecomb Barber. 9. Birth dates for all children given in "History of the Edgecomb Family back as far as the 7th generation" by Lansil Edgecomb (b. 1868), Pennville, IN 16 Sep 1938. 10. Cheryl McDonald Slack, BES family update 173 (c. 2004). 11. 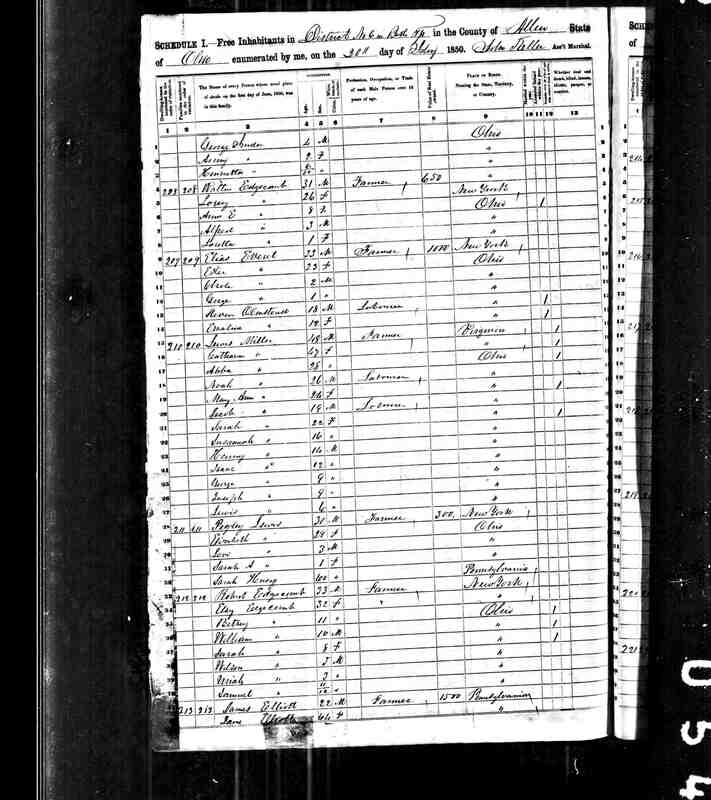 Ruth Anne Dutton, Unpublished list of descendants (2006). 12. 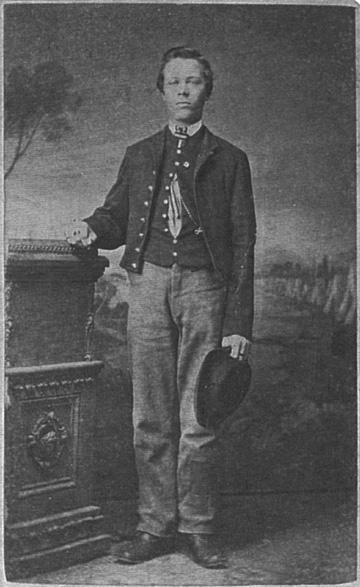 Reuben White was the son of Adam and Rebecca (Walton) White. 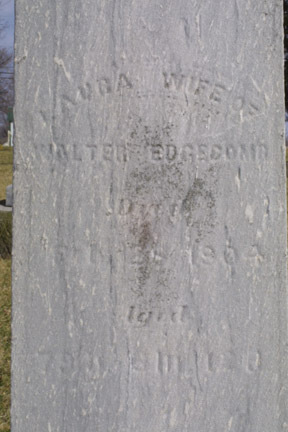 Rebecca Walton was the daughter of Deborah (Gilbert) and Joseph G. Walton who came to the McClure settlement in Bath Township in 1826. Deborah Arvilla Mitchell a.k.a. Gilbert was the daughter of Montaignai Mitchell and Pe-Aitch-Ta, a famous chief of the Shawnee Indians who lived in Allen County before their removal in 1832 and who figures prominently in the early history of the county. For more details, see "A Missionary, An Indian, and a Hill: Their story" from The Allen County Reporter, vol. L11 No. 1 (1996), published by the Allen County Historical Society. 13. 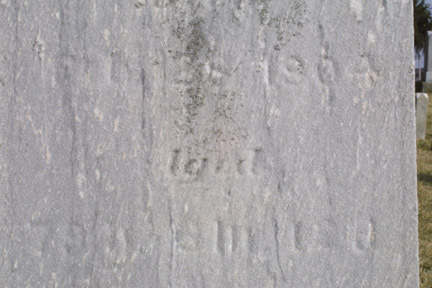 Tombstone of Loretta and James H. Barber (Old Beaverdam, OH Cemetery). 14. Loretta Barber Blackburn, BES family update 114 (1979). 15. Virginia Goble Herdel, BES family update 19 (1977). 16. Hattie Goble Hardy, BES family update 91 (1978). 17. Kathy Herdel, phone call to Susan Snyder (Aug 1999). 18. 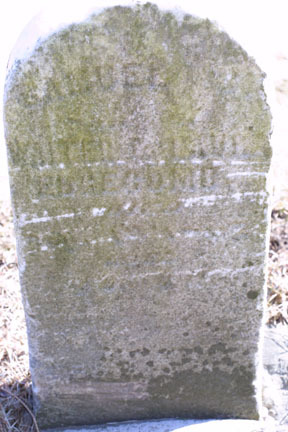 Samuel is buried in the Sproat Cemetery, Wolfe Rd., Bath Twp., Allen Co., OH. 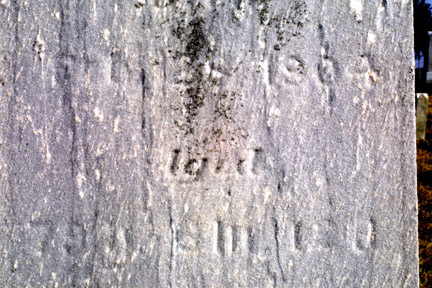 His death date and age are illegible. 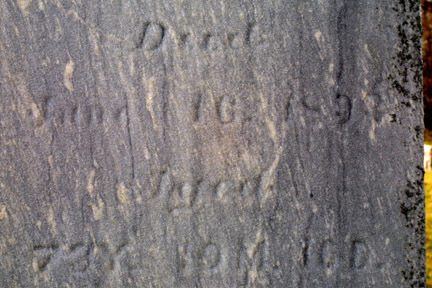 (tombstone image) Family burials generally shifted from the Sproat Cemetery to the old Beaverdam Cemetery around 1880. So it is likely that he died at a young age, possibly in his teens. 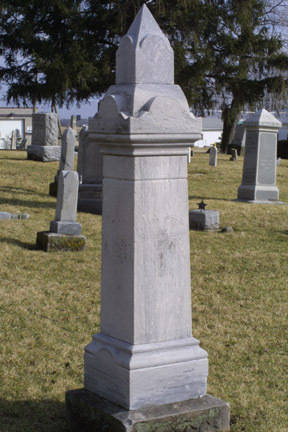 He was deceased in 1885 according to History of Allen. There are no known records of a marriage or children for Samuel, so it is likely that he had no descendants. 19. Treva Edgecomb Fruchey, BES family update 8 (1977). 20. 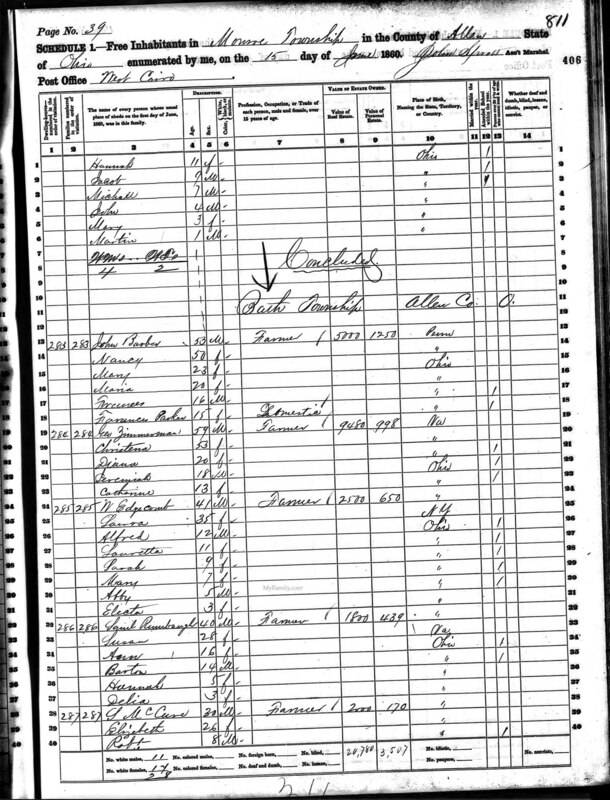 Anonymous, Births and deaths recorded in the minutes of the Bassett, Edgecomb, and Snyder Reunion (1936-1975). 21. Lansil Edgecomb, Jr., Letter from Lansil Edgecomb, Jr. to Steve Bassett (Oct. 8, 1979).